The Broil King Signet 320 (model #986857) Cast-Aluminum, 3-Burner Natural Gas Grill is what every backyard barbecue enthusiast wants on their gazebo, patio, or decked BBQ area. 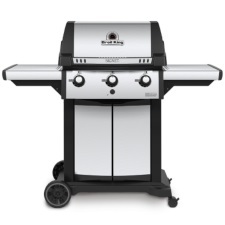 Many backyard barbecuers like this Broil King because it is a natural gas grill. Although your initial outlay is more due to the plumber’s bill for plumbing the gas line into your BBQ area, you will save more on natural gas than liquid propane and there’s a lot less hassle with natural gas. You will not have to worry about whether you have enough gas on-hand to last through the long holiday weekend without calling for another delivery, if they’re even open and not having a BBQ of their own. But, most people do not care if it is propane or natural gas, they buy this Broil King because of its performance and great tasting BBQ flavor. We love using the rotisserie that comes standard on this grill, which is optional on many other comparably priced models. The added rotisserie and 10,000 BTU side burner gives you many more options for cooking your backyard BBQ meals. No need to run to the kitchen to steam or boil the veggies while your busy on the grill because it is right there and handy. These cast-iron grids are durable and retain heat just like your grandmother’s cast-iron frying pans that were still sizzling when she brought it to the table. These grids also deliver superior searing power that locks in flavor and the meat’s natural juices. These plates are reversible so you have a choice of performance. The one side gives you perfect restaurant quality sear marks while on the reverse side, the grooves capture the natural juices from continuous self-basting. This stainless-steel grilling system gives you premium heat distribution that surrounds the whole grill surface and safeguards the burners from early burnout. The drippings, which fall onto those Flav-R-Wave™ grids are immediately vaporized and those vapors produce a self-basting effect that infuses flavor back into your foods, giving your meal an unmistakable BBQ flavor. Every Broil King Signet model is produced with the aluminum Therma-Cast cookbox with a stainless-steel inlay to retain heat naturally for an even and efficient grilling, time after time, season after season due to its long-lasting durability. Plus, the patented and trademarked tube-in-tube technology comes with an unmatched ten-year warranty. This Broil King Signet 320 with natural gas will give you years of joyful BBQ pleasure. It comes with a 10,000 BTU rotisserie for birds and roasts; whereas, many other BBQ grills make it an expensive option. Many of the items which are standard equipment on the Broil King are optional (pay as you go) on other BBQ grills that cost much more, making it a much better value in the long run if you were to buy those options, but for less than $500, it is a bargain even without the added equipment. Just imagine putting a 20-pound turkey or large ham shoulder on the rotisserie while you are preparing the rest of a Holiday meal. This natural grill could replace many of your kitchen appliances and for most of the summer, it probably will. We found 59 verified Amazon buyers who reviewed the Broil King Signet 320 with natural gas. They gave it an average rating of 3.3 stars out 5 stars. 67 percent of these customers rated the Broil King either 4 or 5 stars. Here is a small sampling of the comments left by the 50 verified Amazon buyers, “Very well-built grill that cooks beautifully….” “Awesome grill for the money. Buy one.” … “The Broil King Signet 320 was an excellent purchase.” And, “I deducted one star for the lack of ANY words in the assembly instructions.” However, there is a YouTube video for help with assembly. In summary, this Broil King Signet with natural gas is much less expensive than comparable grills but performs just as well. There have been reports of the burners blowing out when using lower settings for slow cooking. Broil King is looking into a solution but recommends in the meantime to place the unit where it will not be affected by the wind when slow-cooking. Otherwise, this unit performs very well and should provide you with many years of BBQ fun and great tasting meals.